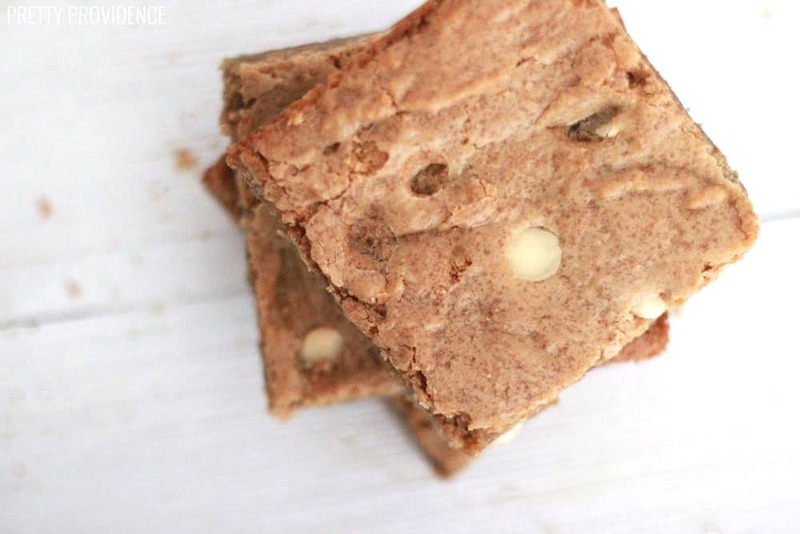 If you love brownies, you will love this blondie recipe too! They are soft, chewy and full of white chocolate chips! 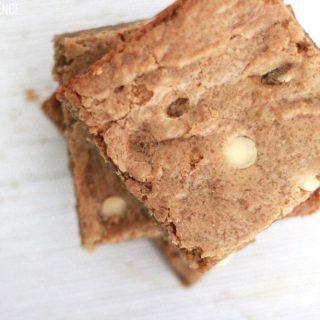 You most likely have the ingredients to make blondies on hand. Right now. These are SO easy, and only take only 30 minutes to whip up. Blondies seem fancy, so when you bring them to a party people will be impressed. Wait… what is a blondie? 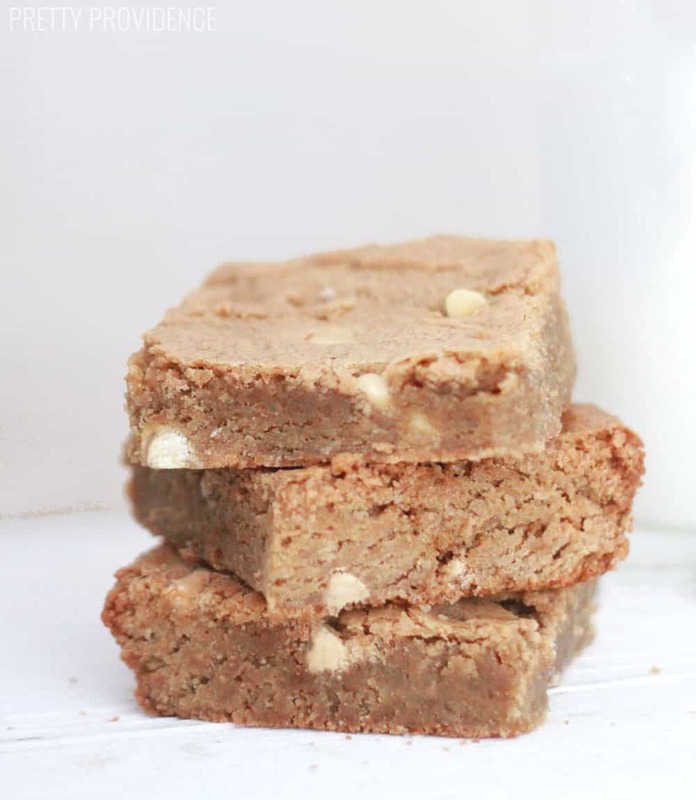 A ‘blondie’ is a ‘blonde brownie’ or basically, a dessert bar that is like a brownie but isn’t chocolate! If you have never had a blondie before, well, I’m sorry. Now you should probably do something about that! I am telling you, proceed with caution. You will not be able to stop eating these until the entire pan is gone! When I make these I love to use my ALL EDGES brownie pan. This was a Christmas gift and I absolutely love it. If you also like the edges best, I highly recommend this. It can be found here on Amazon! In a medium microwave-safe bowl, melt the butter. Add the brown sugar and mix well. Next, add the eggs and vanilla and mix. Add the flour, baking powder, salt and baking soda and blend until combined. Mix in white chocolate chips. Spread batter in the prepared pan. Bake for 25-30 minutes until a toothpick inserted in the center comes out clean or with a few moist crumbs. You could serve these warm with a scoop of vanilla ice cream, or like me, you might just prefer them solo with a glass of milk. YUM these look amazing. 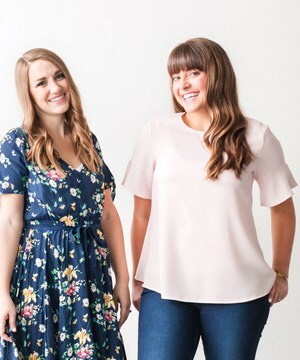 Definitely bookmarking this one! Thanks! I was wondering why the pan had that unusual shape so I’m glad you explained. Looks yummy! Haha yes, it is a little funny looking, all the better for perfect treats though! I’ve been curious about this pan. Thanks for sharing and including a recipe. I’ll have to try it out. Thanks! I hope you like them as much as I do! They are the chewiest, most delicious treat! I think I want them for my birthday instead of cake!